Come to booth #121627 and meet some of the team members. Visit Origin at booth #121627 - IMTS to see its contribution to the Grand Challenge. This is a joint effort by tooling and inspection vendors to demonstrate art to inspected part workflow -- in real time with actual production machines and parts. The 3D Collaboration & Interoperability Congress has become a yearly barometer of the state of collaboration and interoperability strategy, technology, and solutions for commercial and government organizations. Presenters and attendees are real-world users who represent the medical, aerospace, defense, electronics, automotive, industrial equipment, and other product development industries, with strong support by technology leaders for CAD collaboration and interoperability. At the 4:11min mark, see the high level measurement plan that is now ready to be consumed by Origin's CheckMate CMM Programming Software (fully integrated with SOLIDWORKS) to be converted to a CMM program. Then generate an ISO standard DMIS CMM . The QIF MBD and Plan are loaded into the SOLIDWORKS environment using FormatWorks. It's that time of year again for the annual IMTS Show Sept 12 - 17, 2016 at McCormick Place, Chicago, IL. Come and visit Origin at the DMSC Booth: E-5000 to see QIF in action. We look forward to meeting you there! Come and watch Origin's demo's 10am & 2pm daily - DMSC Booth (E-5200). To find this booth, click this link. Come and see Origin receive a QIF document containing features and tolerance, export DMIS to measure a part on a Renishaw Equator™, and translate DMIS format results to QIF Results format and pass that on to another application in a live demonstration with several other companies. Drop by and visit us. This is an event you won't want to miss! Come see Origin International at the DMSC Booth (E-5200) during the IMTS show in Chicago (Sept 8-13) where we will receive a QIF document containing features and tolerance, export DMIS to measure a part on a Renishaw Equator™, and translate DMIS format results to QIF Results format and pass that on to another application in a live demonstration with several other companies. 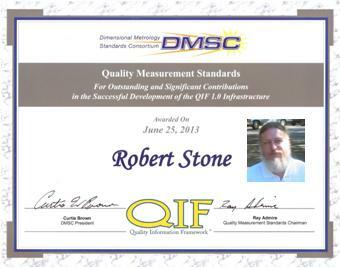 Long time Origin International Associate, Bob Stone, was recognized for his contribution to the new QIF set of standards at the recent DMSC meeting at Hilton Head Island in South Carolina last week.